Summer 1997 – I worked as a barista. July 1999 – Joe gets a job selling music to bookstores across the country. September 2000 – I had a vision of a coffee shop where people could come and feel loved and welcome. November 2001 – Joe began (and eventually completed) writing a business plan for our own coffee shop and bookstore. December 2001 – Joe buys a ton of books and music for us to sell online. March 2002 – Joe becomes a national sales rep, selling even more music to more bookstores. June 2005 – Joe graduates from Bible college and starts the process of planting a church with a coffee house atmosphere. August 2010 – After several years of failure, heartache and frustration, JoKars Wild moves to Central Oregon and falls in love with Prineville. November 18th, 2010 – While looking for a job in the local classifieds, Joe spots an ad for a coffee shop and bookstore looking to sell the business. 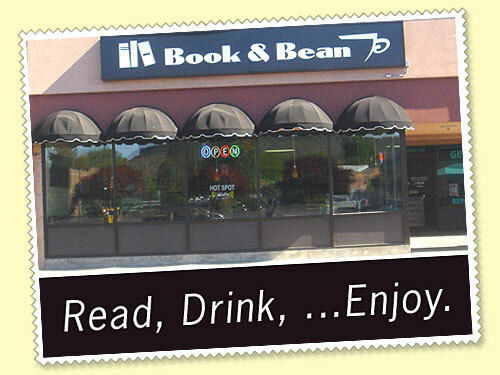 December 15th, 2010 – JoKars Wild becomes the proud owner of Book & Bean. Again, I am amazed and humbled by how great God is. God does not forget. God knows our hearts. God has a plan. “Hey, it’s snowing outside!” said Azariah who has been concerned about snow levels for his 8th birthday next month. “Where have you been?” Papa Joe asks him sarcastically. It has been snowing steadily for the last half hour of our drive up into the Ochoco National Forest to get our Christmas tree. I am feeling quite comfortable in the passenger seat as Joe navigates through the snow with our 4 wheel-drive “Sir Bourbon“, which is what one of the kids dubbed our vehicle. The scenery is beautiful. The evergreen trees look as if they have been slathered with white frosting. The flakes coming down are huge. It is a beautiful sight, and I am thrilled to be able to travel in such a wonderful place. Although I have been blessed that most of my life I have been able to go to a u-cut Christmas tree farm, this is my first experience getting a tree from the forest. 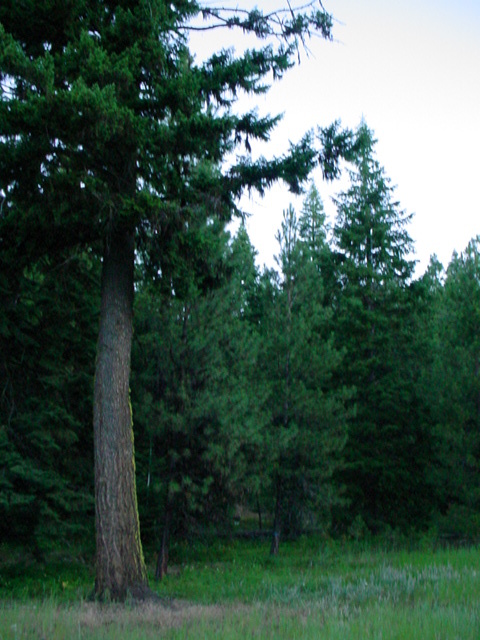 In Oregon, for $5, you can buy a permit to go and harvest your own Christmas tree from the national forest. As long as you stick to a few simple rules, the forest is at your disposal. What a deal! The best Christmas tree lot in America and hundreds of trees to choose from…for only $5 and the price of gas! As we wandered up the forestry road, it was quickly becoming clear that we shouldn’t drive too far up the hill. 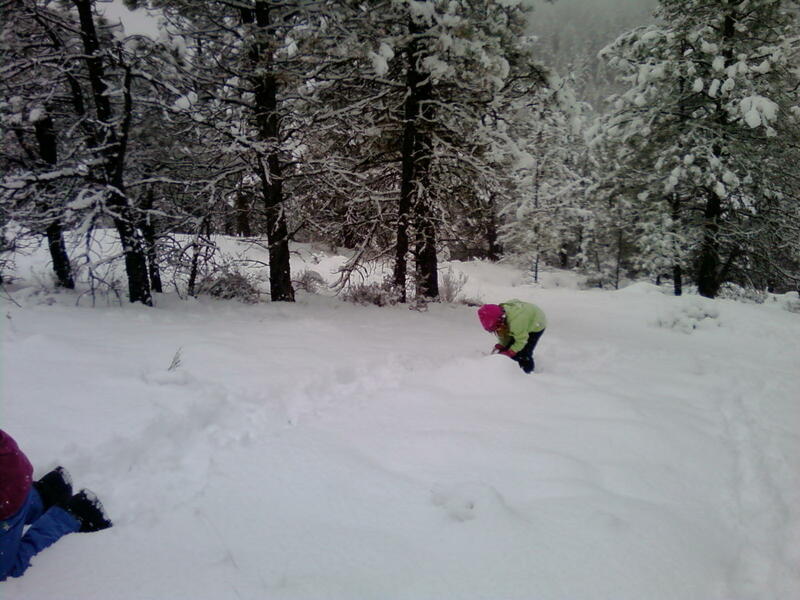 With each increase in elevation, the snow became deeper and deeper. We saw a wide clearing and decided to back in and park. Side note: I am a very nervous passenger. I don’t like sliding, cars too close, trees too close, being towed, towing something, etc. If I can, I drop my head into my hands till it is over. As Joe backed into the spot, the wheels started to spin. I ducked my head down. I didn’t think anything was wrong, but I didn’t want to look either. Next thing I knew though we were sliding a little downhill. I got out of the vehicle to “help direct” Joe, but really I just didn’t want to be in the sliding vehicle. Another note: Don’t make comments on me being a bad mom and leaving the kids to go sliding down a hill. It was only a little ditch and a tree was blocking our sliding…poor tree. I really am a wimp. Well, I am of little help in directing and sure enough, we slide into the tree. Thankfully, we have “rescuers” that live about 20 minutes away. Joe tells us we should all go out and explore and find our tree while he waits for his dad and uncle to come pull us out of the ditch. Michaela offers to stay behind with Nehemiah while the rest of us head for the hills. We had forgotten to bring our camera, but here are a few shots I took with my phone. Notice the small trees are few and far between. 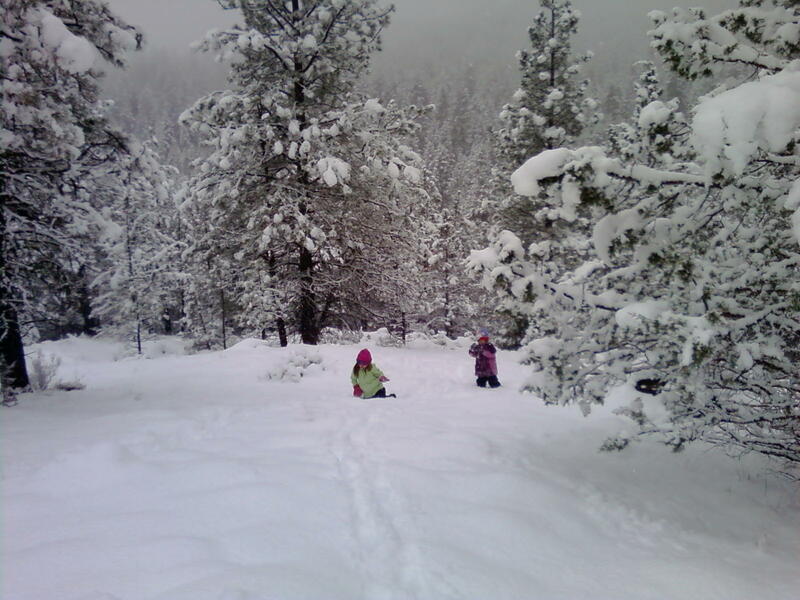 The kids and I were having a wonderful time in the snow, but we still hadn’t found the right tree. The snow was starting to come down heavily, so we decided to head back to the Sir Bourbon. 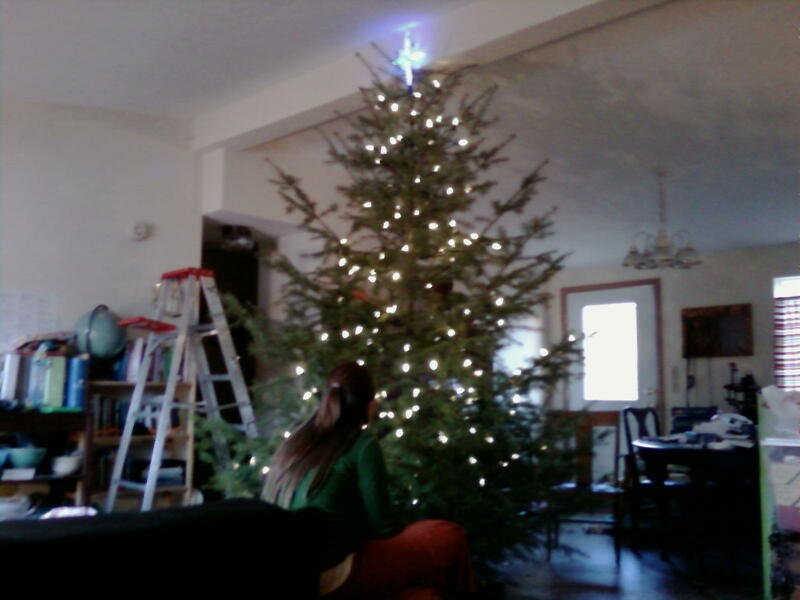 The tree might have to wait for another time. They just about had the Sir Bourbon free after snapping a cable and the use of chains on both 4 wheel-drive vehicles. Joe’s uncle asked if we had found a tree. I told them how Josiah had found one but it was down a hill. He said how it would be a shame to come all the way out here and not get a tree. And, of course, I had to go back down the hill! Thankfully I live with some strong men and children! With the help of Uncle Rick, Papa Joe, and Josiah, the kids got that eleven-foot tree back up the hill! I am still sore three days later from our little tree hunting experience. But it was worth it. This is the most beautiful Christmas tree ever! I know, I know…I haven’t written a post for far too long. Honestly, I am unsure what to write about. I feel like a hypocrite in some ways. I mean, here I blogged about traveling and living in an RV full-time and then the next thing you know…BAM…we are living in a house and sending the kids to public school for the first time EVER! I am in shock too. And instead of traveling and witnessing and getting to know people, I am home every day, all day. I’m clipping coupons, dusting furniture, and doing yard work. I mean this is nothing even to write home about let alone publish for the world to read. Now, don’t think by my cheery nature of writing that every thing is coming up roses. No, hardly. But I don’t like to write about the bad stuff. I don’t want you to feel sorry for me or even to try to fix things. It is just the way things are. I am not like some Americans…looking for a hand out. No, I want to work for what I deserve. And I hope what I deserve is given to me. It pains me greatly not to be living in our RV. I appreciate our “house”, but it isn’t “my home”. Also, we had hoped to build family ties and togetherness, but most of the time we are quite divided. Joe, Josiah and Michaela are gone while I and the other 6 kids are at home. And since I don’t have a vehicle big enough to carry 7 people, we are rather stuck at home. I also had dreams of building relationships with other people, but I only have contact with one other person on a daily basis…my next door neighbor (who is a very nice lady by the way). I had also hoped to be seeing and exploring places as a family. While we have gone to a couple of places, that has become very hard since we have no income. A daily use permit in Oregon costs us $10 a day. That can add up fast. We could get an annual permit but just can’t afford the extra amount. Also, out-of-state licenses for fishing are exorbitant. So we stay at our house. But all is not lost. I have used my vast amounts of time with the little kids to focus on their schooling. Elijah and Azariah are showing great progress in their reading abilities. Also, Kira is able to advance in her math studies. This has been very beneficial to them. I have also finally cleaned up the trailer and am able to use it on a daily basis. Some of the kids are also sleeping in there on occasion. The water line, that we discovered was broken shortly after arriving here, still has not been fixed, but I hope that it will be as soon as funds are available. We woke bright and early Sunday morning to another beautiful day with the smell of pine in the air. It was very brisk out and Joe and Azariah, who were asleep in the truck without blankets, were very cold. Josiah and Elijah were in the car, but I had made them get blankets the night before. We were on the road by 6 cruising along the beautiful eastern mountains of Oregon. I have to admit I was very scared as we descended those hills toward Central Oregon. I kept repeating to myself. “I trust You. I trust You.” We had used up everything we had. We had used the kid’s money for some of the gas, antifreeze, and food. We had used our debit card hoping it wouldn’t be rejected. We had no idea where we were going or what we were going to do. We figured we would boondock at Walmart that night. As we came down the last hill toward Prineville, Joe called me on the cell. He said how about we stop at the parent’s on the way to Redmond. (What was in Redmond? Walmart and also some friends we thought of stopping and seeing.) So we headed to the first parent on the way…Joe’s dad. Because we had very limited funds and were unable to stop, our food for the trip consisted of bagels, chips, popcorn, dry cereal, and jerky. By the time we rolled into Prineville at 10, we had a very hungry crew. During breakfast Joe’s uncle shared about how he had a house that we was trying to sell but because of the economy it was just sitting empty right now. He and Joe’s dad also needed some work done. His dad is trying to clean up his house to get it ready to sell. Also, the house we are in needs a little TLC. They wondered if we could make a trade. We help them and in turn we get a house. After talking it over, we decided we would take them up on the offer. We don’t know how long we will be here. We set out on this journey saying we would be the hands and feet of Jesus. Well, we are very much needed here, and we will stay as long as we are needed. I am still amazed how everything worked out. By the end of the day, Joe’s mom gave us food, we were given some cash, and we had a partially furnished house to sleep in. This house is amazing! The water works so well! And no rust!!! I have an enormous kitchen with the largest oven and fridge! I am flabbergasted! The kids are also loving it for the most part. Michaela misses her friends, but she does really like the area. Joe, Josiah, Michaela, Elijah, and Azariah are all working over at Joe’s dad’s on the house and yard. That was one thing we really wanted…the ability to work together as a family. Some have asked whether the adventure is over. No, I don’t think so. We still have plans to go to the coast in the trailer and to Washington. But for now, we are here where we are needed. It was a tough week for us here at JoKars Wild this past week. Our electricity was schedule to be shut off on Saturday morning. Being that we have well water this meant that we would also have no water. We had already extended it a week and had no resources to pay the bill. But someone stepped up to the plate and paid our bill. Thank you! We also have not been able to drive our pick up truck for quite a few weeks. The brakes were seized up on one side. The truck also needed new tires. Another individual offered to pay for our tires. Joe had gotten some money a couple of weeks ago and bought new brakes to put on. At that time we didn’t know they had seized up on one side. After much struggle and frustration, Joe was not able to fix the passenger side. So Friday, he decided to take truck into town to get the new tires and hope they could unfreeze the brake. His plan was then to finish fixing it at home. But the repair center did it all and didn’t charge us for the brake repair! So we now have new tires and new brakes on our truck. Praise God. Since our truck is now operational, we can finish emptying our home and be on the road. We have decided to have everything that is left in our house be given away for free…a Free Sale. It is this Friday from 10-4. Our plan (and I am fully aware that “our plans” are not always God’s plan) is to hit the road on Monday, July 26th. This would allow us to be in Prineville, OR by July 30th for Joe’s high school reunion. Today we gave our cat away. It was hard for everyone to see her go. We have had Ali for 11 years. She has been a part of our family for a long time. She came with us from Oregon 10 years ago. I hope she will be happy. We also received another sizable amount to help with our gas expenses. This is a huge plus as driving to Columbus to take Josiah to the zoo gets kind of spendy. But we feel it is worth it. He is worth it. If you have been to our website lately, you may have noticed little changes. I finished creating our website through FrontPage only to find out that our host doesn’t allow us to do that. So I have to go through and change each thing online. It is a slow process. I am thankful for the knowledge God has given me and for having a technologically gifted husband 😉 Overall, I don’t think I’ve done too bad for my first website. I am hoping to keep learning more though. And maybe I might meet some website savvy friends along the way who can give me tips.